Takeaway: Just like unicorns, Loch Ness monster and Bigfoot, proprietary deals are mythical creatures rarely encountered. So, just how can a PE firms find the right deal flow? We listened to ParkerGale's Private Equity Fundcast episode on deal flow the other day and found their discussion on deal sourcing insightful. Every PE claims to have access to proprietary deal flow, but as anyone in the industry knows, these are rare mythical creatures that many people believe don't even exist. ParkerGale's partner, Devin Mathews clarifies that "the magic of creating deal flow is getting deeper into that pyramid where there are so many more businesses, and it is hopefully less competitive because there aren't as many other firms, or funds, or companies trying to buy those businesses." Private equity firms are very good at finding companies in market. These are typically deals that have been shopped to many prospective buyers and the higher quality opportunities are subject to a competitive auction process. Sourcing opportunities at this level of deal flow requires brute force and loads of resources to continuously connect with intermediaries. Phone calls and endless travel to conferences are the primary activity that PE firms use to uncover deals that are a match for their current buy-side mandates. Online deal sourcing platforms have provided some efficiency in this area to match relevant buy-side mandates with sell-side opportunities. Many deal makers have already warmed up to technological tools that supplement traditional sourcing methods, but these tools are only useful if populated with relevant and quality deals. This is where the challenge lies. Many intermediaries are still skeptical of online deal sourcing platforms, citing the need for customized buyer listing and risk of leaking confidential information. As evidenced with other online marketplaces, over time these concerns will fade. So for the time being, in conjunction with phone calls and travel, PE firms will use online deal sourcing as a fail safe to ensure that they are not missing any opportunities. Unfortunately, the search for the great proprietary deal is not found at this level. Reaching this level of deal flow requires actions that keep the PE firm "top of mind" for the intermediaries and advisors that have relationships with business owners. Specific activities that accomplish this task are similar to ones used in uncovering the first layer of deal flow: phone calls and travel. 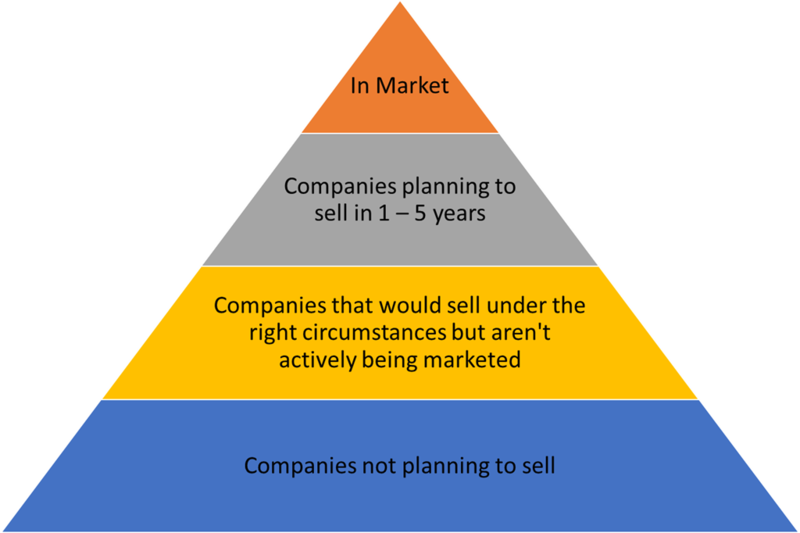 Rather than asking to see in market opportunities, communication of your firm's investment objective is more relevant. Luckily, the Internet has made communicating a PE firm's deal wishlist more scalable. Email newsletters are a tool of the trade that many private equity firms use to connect with intermediaries and, as per PrivCap Special Report on Deal Sourcing, it is the preferred method of communication. Broadcasting specific buy-side mandates is an excellent way of maintaining that "top of mind" status. They are more detailed than general investment criteria and succinctly describe what you are looking for. This makes it as easy as possible for intermediaries to know exactly which deals will get you excited. Unfortunately, it is unlikely that any advisor will accelerate their client's exit planning process and forego a competitive auction for a negotiated deal with the PE firms reaching this level of deal flow. That said, these activities are extremely important to being included on high-quality auction processes when companies are in market. Alas, still no proprietary deals to be found at this level. At this level of deal flow, a PE firm is trying to reach the company owner directly. The most widely used tactic is to cold call companies that have been identified as good potential acquisition targets. The success rate of this practice is dismal and often times tarnishes the brand of the PE firm. So how else can you reach this level of deal flow? Our answer to this question is education. Provide these business owners with compelling reasons why your PE firm is the perfect fit for their business. Tell them about the value creation activities employed in your other portfolio companies that have made those owners filthy rich. Teach them how a private equity recapitalization can mitigate risk for the business owner but still present a significant upside. Show them how your industry expertise can help take their business to the stratosphere. These are the circumstances that will compel a business owner to engage in meaningful conversations with a private equity group before going to market. Education is a long-term strategy to build brand awareness and demonstrate expertise. It might not drive leads in the short term, but it will differentiate private equity from their competitors in the long run. Channels that are used to educate include webinars, articles, panel discussions, seminars, etc. Congratulations to those few PE firms that have engaged in these sorts of activities: this is the path to sourcing the elusive proprietary deal. One could argue that sourcing quality deal flow is the most significant indicator of a private equity fund's success. More and more LPs want to understand how the GPs will find their deal flow. Employing a strategy that uncovers opportunities at all three levels of deal flow should be the goal of all private equity firms. The quest for a proprietary deal is possible. Divestopedia offers deal sourcing campaigns centered around education that help private equity firms get deeper into the pyramid while still ensuring coverage of all in market opportunities. If you are interested to learn more, please contact our founder, John Carvalho, directly at (780) 932-3632 or john@divestopedia.com.